Browsing around a suburban Melbourne music shop with my bass player partner Nikki several years ago, we chanced upon a Hofner Beatle bass. It was in such fine condition that at first we assumed it was a new instrument. When the shop owner told us that it was an original 1964 model, we decided to take a closer look. 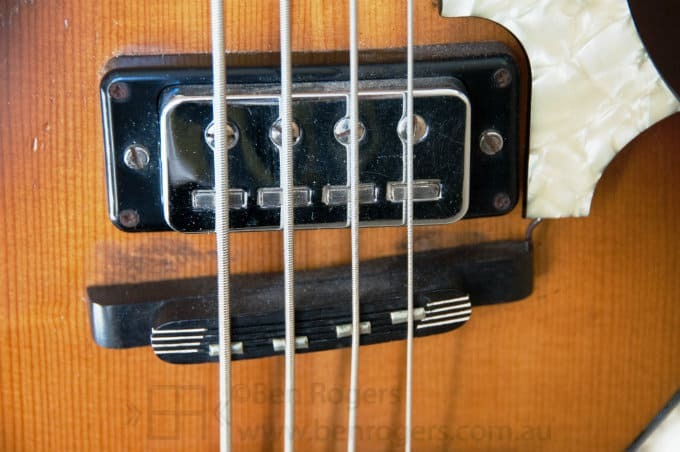 This bass was being offered for sale on behalf of its original owner, who provided a letter indicating that he’d used the bass for many years for live band work and recording sessions, but when the “slap and pop” bass style became popular he’d moved on to another instrument more suited to this technique, keeping the Beatle bass for special occasions. 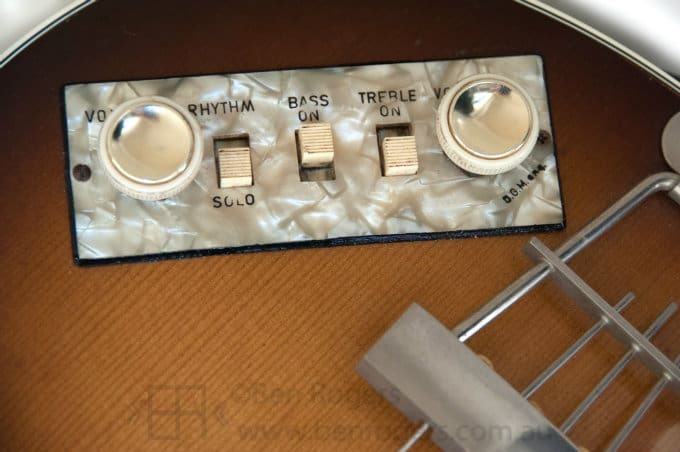 The owner’s letter also stated that the instrument had been on lay-by for 12 months in 1965 from a Melbourne city store called Suttons Music (now long-gone). This dated the bass as a 1964 model, as is Nikki! 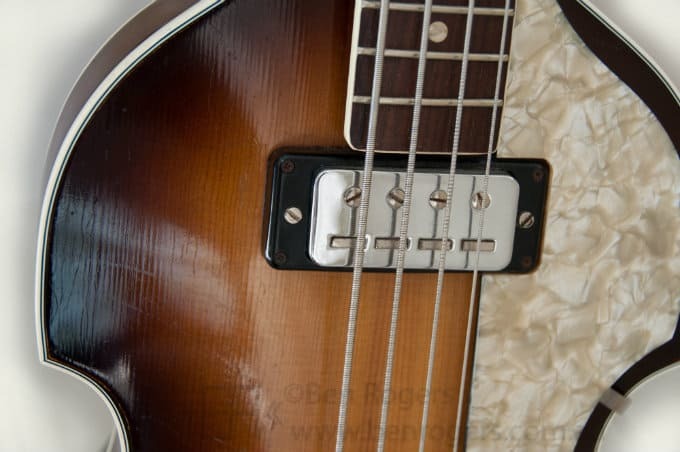 Being a long-time admirer of these beautiful basses, Nikki considered this to be the perfect excuse to buy this fine example, and she duly became the proud owner of a Hofner 500/1 Violin bass, or “Beatle bass”. After some minor set-up adjustments and a new set of strings, the Beatle bass became Nikki’s favourite bass guitar, displacing her much loved seventies-era Rickenbacker*. Some months later I happened to meet the original owner. 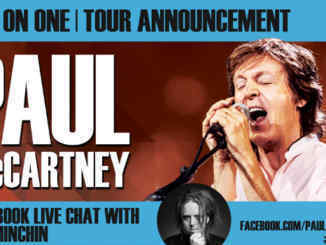 We were unaware of the connection until he mentioned that he’d sold his old Hofner Beatle bass to a lady who shared its birthday. 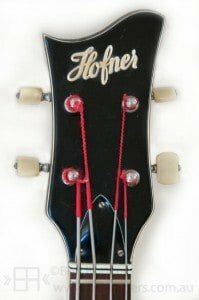 More recently, reading up on Hofner basses I started to wonder about the date of this instrument. 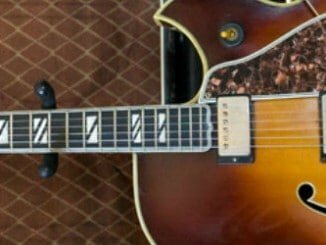 The serial number and a couple of identifying features such as the size of the control panel and pickup surrounds indicated a 1965 year of manufacture. Eventually it became apparent that Nikki’s “birthday bass” is actually a 1965 model, not a 1964. The letter from the original owner was ambiguous, and upon re-reading we’ve concluded that he must have put it on lay-by in 1965 and then taken delivery in 1966. Nikki’s very slight disappointment about the year of manufacture was quickly assuaged by the knowledge that she probably wouldn’t have given in to the temptation of purchase without the emotional lure. Sometimes ignorance is a wonderful thing! *And no, Nikki assures me the Ricky won’t be appearing on Ebay.